, an eminent English antiquary, was descended from an ancient family of his name, which flourished in the time of Henry III. at Bekington in Hampshire, and in the fifteenth century was settled in Norfolk, where our author’s great-grandfather was possessed of a considerable estate. This great-grandfather married the heiress of the Narborough family, by whom he had a son who became sir John Spelman, knt. of Narborough, and our author’s father, Henry, was the fourth son of sir John, and lived at Conghata near Lynn-regis in Norfolk. He married Frances, daughter of William Sanders of Ewell in Surrey, by whom he had our author, his eldest son, who was born in 1562, and educated at the school of Walsinghatn in the neighbourhood. In his fourteenth year, when according to his own modest account he was scarcely ripe for academical studies, he was entered of Trinity-college, Cambridge. Here he applied with great diligence for two years ana a half, but upon the death of his father, he was obliged to return home, and assist his mother, in managing the affairs of the family. After remaining at Congham about a year, he was admitted of Lincoln’s-inn, with a view to the law as a profession. This, however, he appears to have studied rather in a general way, as far as respected the laws, customs, and constitution of his country, and at the same time cultivated polite literature and antiquities. When almost of age, he returned to Norfolk, and married Eleanor, the daughter of John Le Strange, a gentleman of an ancient family in the same county. He now employed himself in rural and domestic affairs, studying also, at intervals, the constitution and antiquities of his country; and having some property, either paternal or acquired by his marriage, he was enabled to add to it by certain purchases, particularly of the lease of Blackburgh and Wrongey abbies in Norfolk. Besides a family of his own, he had the | guardianship of sir Hamon Le Strange, Kis brother-in-law, and during his minority, resided at Hunstanton, the seat of sir Hamon. The first fruit of his studies, said to have been begun when very young, was a Latin treatise on coats of arms, entitled “Aspilogia,” in which he displays a considerable fund of curious information; and he frequently employed himself in making transcripts of several foundation-charters of the monasteries of Norfolk and Suffolk. Having been admitted a member of the original society of antiquaries, he became acquainted with those celebrated lovers of that science, Camden, sir Robert Cotton, and others, whose conversation improved his knowledge, and decided his taste for pursuits similar to what had engaged their attention. In 1594 he is thought to have written “A Discourse concerning the Coin of this kingdom,” chiefly with a view to prove the immense treasures which had been drawn from England, in consequence of the usurpations of the pope. In 1604 he served as high sheriff of Norfolk, of which county he furnished Speed with a description, and being now distinguished for his abilities, he was sent by king James three several times into Ireland as one of the commissioners for determining the unsettled titles to lands and manors in that country; and at home was appointed one of the commissioners to inquire into the oppression of exacted fees in all the courts and offices of England, as well ecclesiastical as civil; which bishop Hacket calls “a noble examination and full of justice.” This gave rise to his learned treatise “De Sepultura,” or of “Burial Fees,” in which he proved the existence of very exorbitant exactions. These employments, however, having tended to the injury of his fortune, the government was so sensible of his services, that a present of 300l. was made him, not as a full recompence“(for so it is expressed in the king’s writ), but only” as an occasional remembrance," till something more equal to his merit could be done for him. He was also knighted by James I. who had a particular esteem for him; as well on accountof hisknown capacity for business, as his extensive learning, especially in the laws and antiquities of our nation, which were the constant subjects of his researches. With a view to pursue those researches with more advantage than was possible in a country residence, he determined to remove to London. Accordingly in 1612, he sold his stock upon the farms, let out his | estate to tenants, and removed with his family to the metropolis, where he had a house in Barbican. While here employed in investigating “the grounds of the law from original records,” which engaged him in a perusal of the fathers, councils, and ancient historians, he was for some time diverted from this pursuit by a conversation with his uncle, Mr. Francis Sanders, who complained to him of the many crosses and disappointments he had met with in a building he had then in hand upon the glebe of his appropriated parsonage at Congham. Sir Henry, who had a profound veneration for church-property, told his uncle that this was a judgment upon him for defrauding the church, and that it was utterly unlawful to keep appropriated parsonages in lay hands; and finding him somewhat impressed with what he had said, he expatiated more fully on the subject in a written paper, which, owing to Mr. Sanders’s death, never reached him. It was, however, published under the title “De non temerandis Ecclesiis,” or, “Churches not to be violated.” He reprinted it in 1615, 8vo, and about the same time a defence of it against an anonymous writer, with a Latin epistle to Mr. Richard Carew, who had made some objections to his treatise. The effect of sir Henry’s arguments was very extraordinary; for several persons actually parted with their impropriations. That he was sincere himself is sufficiently obvious, for being possessed of the impropriation of Middleton in Norfolk, he disposed of it for the augmentation of the vicarage, and also some additions to Congham which lies near it. 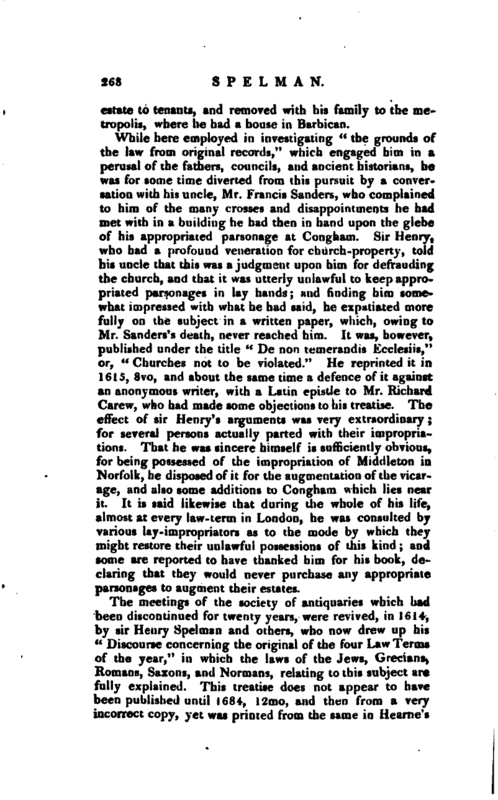 It is said likewise that during the whole of his life, almost at every law-term in London, he was consulted by various lay-impropriators as to the mode by which they might restore their unlawful possessions of this kind; and some are reported to have thanked him for his book, declaring that they would never purchase any appropriate parsonages to augment their estates. The meetings of the society of antiquaries which had been liscontinued for twenty years, were revived, in 1614, by sir Henry Spelman and others, who now drew up his “Discourse concerning the original of the four Law Terms of the year,” in which the laws of the Jews, Grecians, Romans, Saxons, and Normans, relating to this subject are fully explained. This treatise does not appear to have been published until 1684, 12mo, and then from a very incorrect copy, yet was printed from the same in Hearne’s | “Curious Discourses,” along with others on the same subject, by Mr. Joseph Holland and Mr. Thomas Thynn. In 1621, an apology for archbishop Abbot, respecting the death of a park-keeper, (see Abbot) was answered by sir Henry, who endeavours to prove, not only that the archbishop was guilty of an irregularity by that act, but also intimates that he could not be effectually reinstated without some extraordinary form of new consecration. He even goes so far as to assert that by the canons hunting is unlawful in a clergyman; and he also advances many other positions to which no very cordial assent will now perhaps be given. which began at M, where there were three M’s that scandalized the archbishop—Magna Charta; Magnum Concilium Regis; and “f hiatus in ms.” This seems to confirm what bishop Gibson says, but another reason for discoutinuing the work might be the want of public taste. He offered the work to Bill, the king’s printer, for the small sum of five pounds for copy-right, and that to by paid in books, yet Bill refused it, and this first part was therefore printed at sir Henry’s expence. Bill, however, was not much to blame, considering the matter as a commercial speculation, for at the end of eleven years the greatest part of the impression remained unsold; but at that time, in 1637, two booksellers, Stephens and Meredith, ventured to bargain with him for the unsold copies. 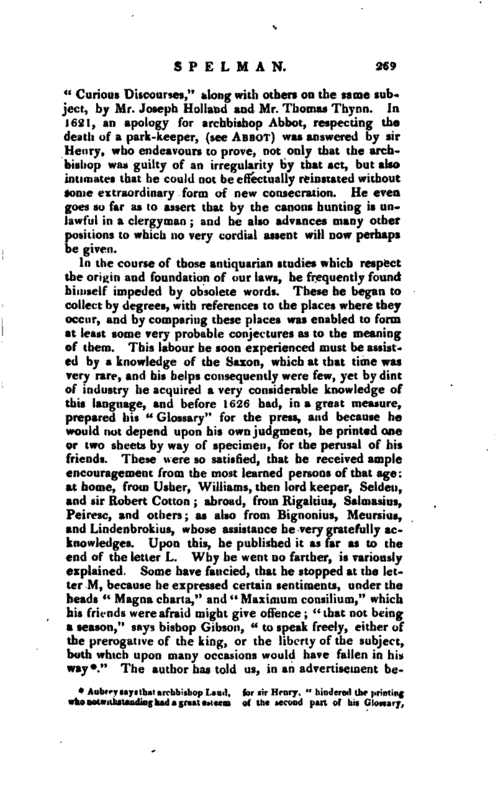 The author has told us, in an advertisement | bcfore the book, that he chose to entitle his work, “Archacologus,” rather than “Glossarium,” as we commonly call it: for a glossary, strictly speaking, is no more than a bare explication of words; whereas this treats more especially of things, and contains entire discourses and dissertations upon several heads. For this reason, it was thought worthy not only to be consulted upon occasion, like common lexicons or dictionaries; but it ought to be carefully perused and studied, as the greatest treasure extant of the ancient customs and constitutions of England. 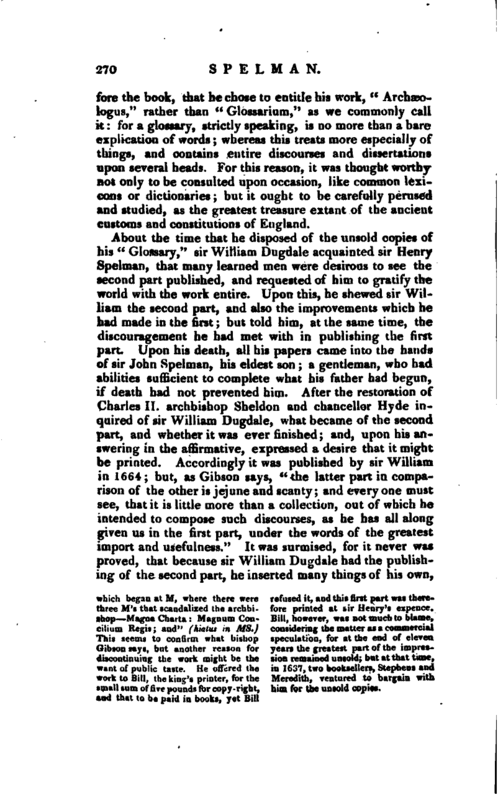 About the time that he disposed of the unsold copies of his “Glossary,” sir William Dugdale acquainted sir Henry Spelman, that many learned men were desirous to see the second part published, and requested of him to gratify the world with the work entire. Upon this, he shewed sir William the second part, and also the improvements which he had made in the first; but told him, at the same time, the discouragement he had met with in publishing the first part. 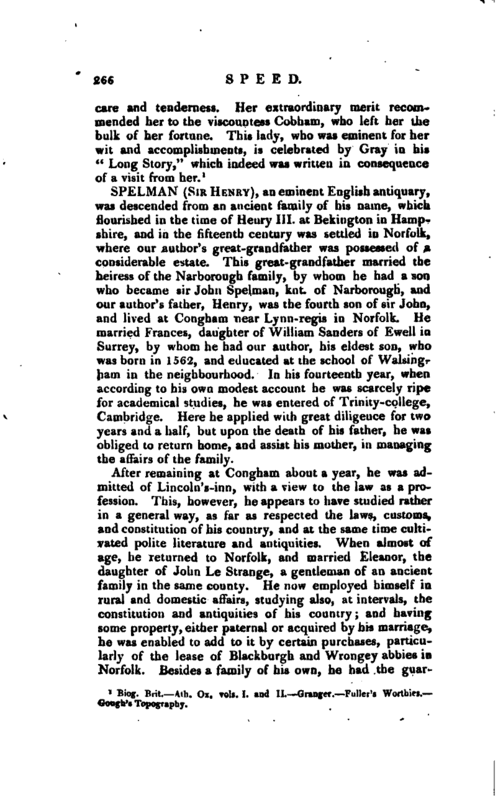 Upon his death, all his papers came into the hands of sir John Spelman, his eldest son; a gentleman, who had abilities sufficient to complete what his father had begun, if death had not prevented him. After the restoration of Charles II. archbishop Sheldon and chancellor Hyde inquired of sir William Dugdale, what became of the second part, and whether it was ever finished; and, upon his answering in the affirmative, expressed a desire that it might be printed. Accordingly it was published by sir William in 1664; but, as Gibson says, “the latter part in comparison of the other is jejune and scanty; and everyone must see, that it is little more than a collection, out of which he intended to compose such discourses, as he has all along given us in the first part, under the words of the greatest import and usefulness.” It was surmised, for it never was proved, that because sir William Dugdale had the publishing of the second part, he inserted many things of his own, | which were not in sir Henry Spelman’s copy; and particularly some passages, which tend to the enlargement of the prerogative, in opposition to the liberties of the subject. This- is noticed by Mr. Atwood, in his “Jus Anglorum ab antique” and the authenticity of it is vindicated, and some curious particulars are related concerning it, by Dr. Brady, in his “Animadversions on Jani Anglorum f’acies nova,” Bishop Gibson also assures us, that the very copy from which it was printed, is in the Bodleian library in sir Henry’s own hand, and exactly agrees with the printed book; and particularly under the word “Parlamentum,” and those other passages, upon which the controversy was raised. So far then as the copy goes, for it ends at the word “Riota,” it is a certain testimony, that sir William Dugdale did no more than mark it for the printer, and transcribe here and there a loose paper; and, though the rest of the copy was lost before it carne to the Oxford library, on which account there is not the same authority for the Glossary’s being genuine of the letter R; yet it is not likely, that sir William had any more share in these last letters of the alphabet, than he had in any of the rest. There was a third edition in 1687, illustrated with commentaries, and much enlarged. In 1627, sir Henry compiled a history of the civil affairs of the kingdom, from the conquest to Magna Charta, taken from the best historians, and generally in their own words. This was printed by Wilkins at the end of his edition of the Saxon laws. His next great work was his “Collection of the Councils, Decrees, Laws, and Constitutions of the English church from 1066 to 1531.” In this he was particularly encouraged by the archbishops Abbot, Laud, and especially Usher. The deceased bishop Andrews had suggested this scheme to Dr. Matthew Wren, who had made some progress, but desisted when he heard that sir Henry Spelman was engaged in the same design. Archbishop Abbot lived to see some part of the copy, and greatly approved of it. He branched his undertaking into three parts, assigning an entire volume to each division: I. “From the first plantation of Christianity to the coming in of the Conqueror in 1066.” 2. “From the Norman conquest to the casting off the pope’s supremacy, and the dissolution of monasteries by Henry VIII.” 3. “The History of the Reformed English Church, from Henry VIII. to his own time.” The volume, which contained the first of these heads, was published in 1639, about two years befoiv | death, with his own annotations upon the more difficult places. The second volume of the “Councils,” was put into the hands of sir William Dugdale, by the direction of Sheldon and Hyde. Sir William made considerable additions to it ont of the archbishop’s registers and the Cottonian library; and it was published in 1664, but with abundance of faults, occasioned by the negligence of either the copier, or corrector, or both. His revival of Saxon literature was of great importance to the study of antiquities. He had found the excellent use oi" that language in the whole course of his studies, and much lamented the neglect of it both at home and abroad; which was so very general, that he did not then know one man in the world, who perfectly understood it. This induced him to found a Saxon lecture in the university of Cambridge, allowing lOl. 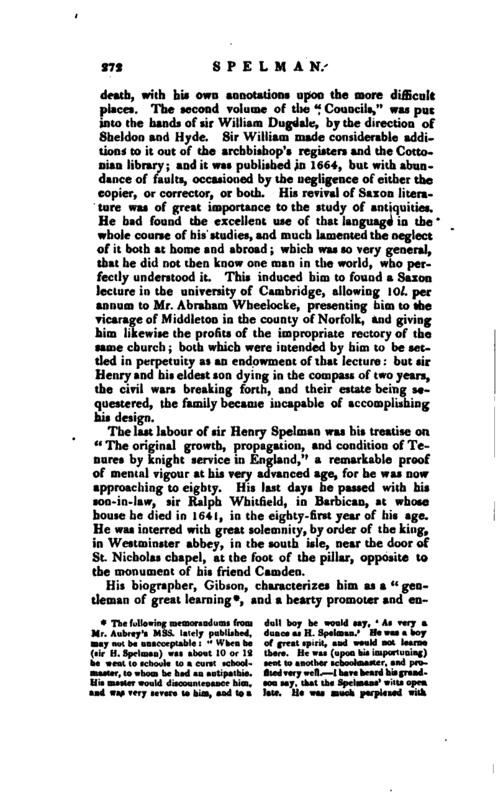 per annum to Mr. Abraham Wheelocke, presenting him to the vicarage of Middleton in the county of Norfolk, and giving him likewise the profits of the impropriate rectory of the same church; both which were intended by him to be settled in perpetuity as an endowment of that lecture: but sir Henry and his eldest son dying in the compass of two years, the civil wars breaking forth, and their estate being sequestered, the family became incapable of accomplishing his design. The last labour of sir Henry Spelman was his treatise on ft The original growth, propagation, and condition of Tenures by knight service in England," a remarkable proof of mental vigour at his very advanced age, for he was now approaching to eighty. His last days he passed with his son-in-law, sir Ralph Whitfield, in Barbican, at whose house he died in 1641, in the eighty-first year of his age. He was interred with great solemnity, by order of the king, in Westminster abbey, in the south isle, near the door of St. Nicholas chapel, at the foot of the pillar, opposite to the monument of his friend Camden. lawe-suites and worldly troubles, so that he was about 40 before he could settle himselfe to make any great progresse in learning,, which when he did, we find what great monument of antiquarian knowledge he hath left to the world.—He was a handsome gentleman (as appears by his picture in Bibliotheca Cottoniana) strong and valiant, and wore always his sword, till he was about seventy or more, when finding his legges to faulter throagh feebleness as he was walking, `Now,‘ said he, ` ’tis time to leave off my sword.‘— When his daughter-in-law, (sir John’s wife) returned home from visiting her neighbours, he would always ask her what of antiquity she had heard or observed, and if she brought home no such account, he would chide her (jestingly. )—Sir William Dugdale knew sir Henry Spelman, and saves he was as tall as his grandson, Harry Spelman. He has been told that sir Henry did not understand Latin perfectly till he was fourty years old. He said to sir William, `We are beholden to Mr. Spelman and Stowe for stitching up for us our English history.‘ It seems they were both taylors.’’ Letters by eminent persons, 1813, 3 vols. 8vo. and a hearty promoter and | encourager of it: in his temper calm and sedate, and in his writings, grave and inoffensive; a true lover of the established church, and a zealous maintaii.er of h r rights and privileges.” During the early part of king diaries’ s differences with the parliament, he allowed that the latter had some ground for complaint, and that abuses prevailed which he wished to see rectified but it is too much to infer from this, as some have done, that sir Henry Spelman would have been less loyal, less a supporter of the constitution in church and state than, he had always profeassed himself, had he lived to see the unhappy consequences of civil discord. As an encourager of learning, and above all a contributor to the knowledge of the antiquities of his country, he is entitled to the highest veneration. He patronized Speed and Dodswortb, and he brought forward Dugdale. On the death of sir Henry, his papers became the property of his eldest son, sir John Spelman, whom he calls “the heir of his studies.” Sir John, whom, by the way, Wood erroneously calls sir Henry’s youngest son, received great encouragement and assurance of favour from Charles I. 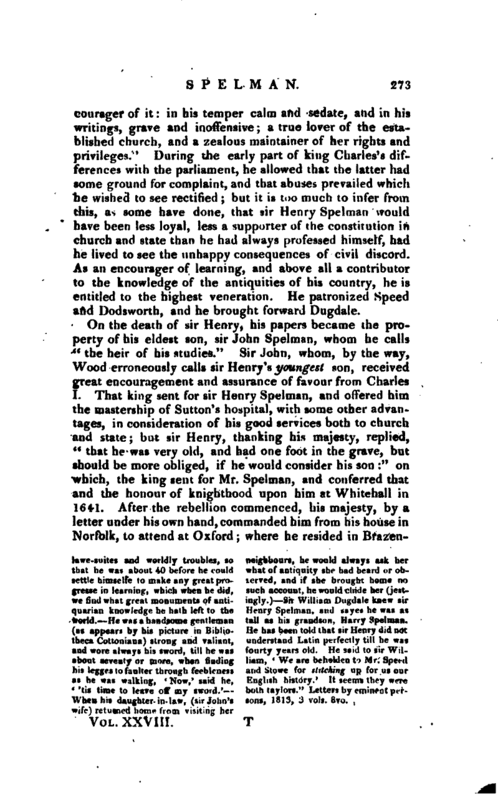 That king sent for sir Henry Spelman, and offered him the mastership of Sutton’s hospital, with some other advantages, in consideration of his good services both to church and state; but sir Henry, thanking his majesty, replied, “that he was very old, and had one foot in the grave, but should be more obliged, if he would consider his son” on which, the king sent for Mr. Spelman, and conferred that and the honour of knighthood upon him at Whitehall in 1611. After the rebellion commenced, his majesty, by a letter under his own hand, commanded him from his house in Norfolk, to attend at Oxford where he resided in | Brazennose college, and was often called to private conncii, and employed to write several p.ipers in vindication of the proceeding of the court. He wis the author of “A view of a pretende book, entitled, ‘ Observations upon his Majesty’s late Answers and Epistles,” Oxford, 1642, 4to. His name is not to it; but Dr Barlow, who ha i received a copy from him, informed VVood that it was composed bv him. Si: John wi“’e also” The case of our affairs in law, religion, and other circumstances, briefly ex mined and presented to the cmisc ence,“1643, 4to. While he vva^ thus attending the aduirs of the public, and his own private studies, as those ‘ >uld iiive him leave, he died July 25, 1643. His funeral sermon, by his majesty’s special order, was preached by archbishop Usher. He published the Saxon Psalter under the title of” Phaltenum Davidis Latino-Saxonicum Vetus,“1641, 4to, from an old manuscript in his father’s library, collated with three other copies. 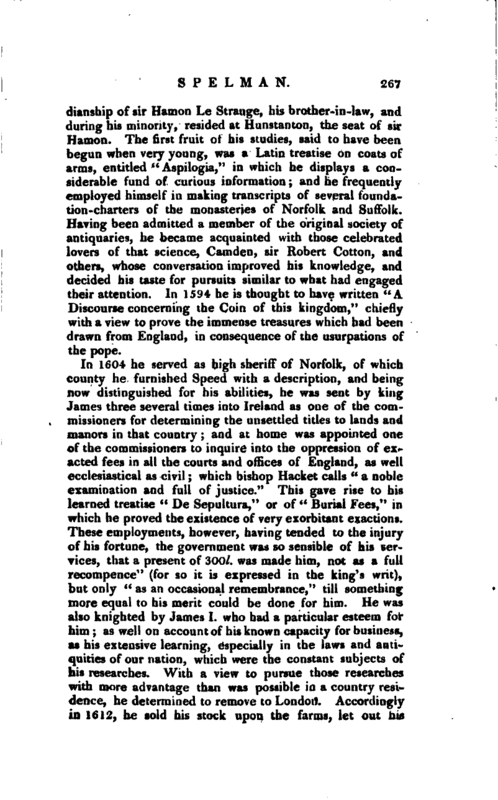 He wrote also the” Life of king Alfred the Great" in English, which was published by Hearne at Oxford, 1709, 8vo. It had been -translated into Latin by Mr. Wise, and was published by Obadiah Walker, master of University college at Oxford in 1678, fol. After sir John’s death, his father’s papers came into the hands of his son-in-law, sir Ralph Whitfield. In 1647, the rev. Jeremiau Stevens, who had assisted sir Henry in preparing the first volume of the “Councils,” printed from sir Henry’s Mss. a work entitled “Sir Henry Spelman’s larger Treatise concerning Tithes,” &c. in which the author shews the danger of changing tythes for any other kind of’ maintenance, as of a pecuniary stipend, which the alteration in the value of money might affect. He observes, that any change of the laws, which have existed above a thousand years, and of a right settled by common law, will produce wany mischiefs, especially to the crown, in the payment of tenths and first-fruits; and he proves the propriety of this kind of support above all others, from this circumstance, that it puts the clergy on the same tooting with the people, feeing equally gainers or losers according to the prices in times of plenty and scarcity. In 1656, a volume was published, entitled “Villare Anglicum; or a view of the towns of England, collected by the appointment, at the charge, and for the use, of that learned antiquary sir Henry Spelman.” Bishop NicolsbH thinks this wasjointly composed by sir Henry and Mr. | Dodsworth. 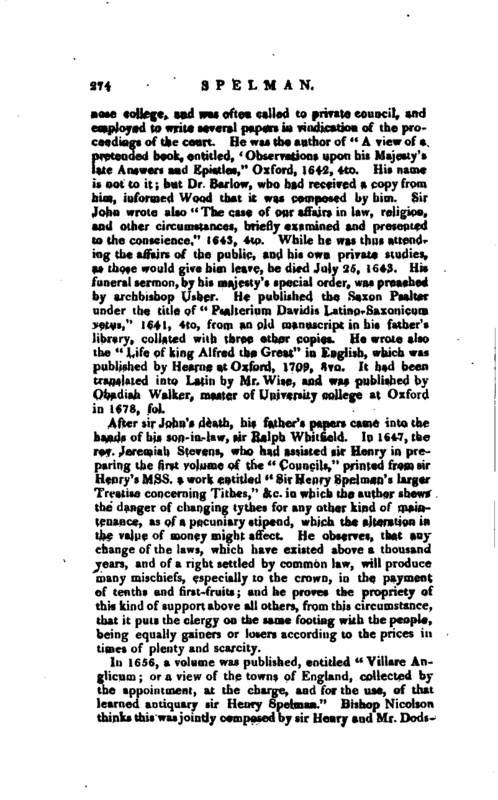 In 1663, Mr. Stevens, before mentioned, who appears to have been particularly entrusted with such of sir Henry’s Mss. 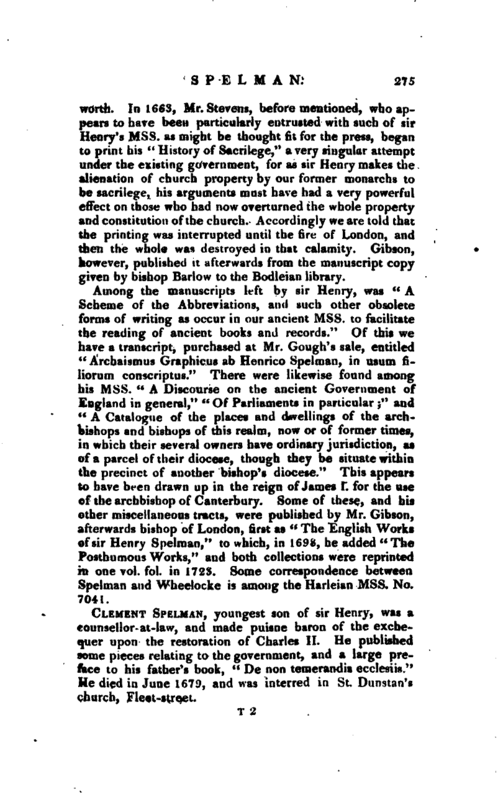 as might be thought fit for the press, began to print his “History of Sacrilege,” a very singular attempt under the existing government, for as sir Hemy makes the alienation of church property by our former monarchs to be sacrilege, his arguments must have had a very powerful effect on those who had now overturned the whole property and constitution of the church. Accordingly we are told that the printing was interrupted until the fire of London, and then the whole was destroyed in that calamity. Gibson, however, published it afterwards from the manuscript copy given by bishop Barlow to the Bodleian library. Among the manuscripts left by sir Henry, was “A Scheme of the Abbreviations, and such other obsolete forms of writing as occur in our ancient Mss. to facilitate the reading of ancient books and records.” Of this we have a transcript, purchased at Mr. Cough’s sale, entitled “Archaismus Graphicus ab Henrico Spelman, in usum filiorum conscriptus.” There were likewise found among his Mss. 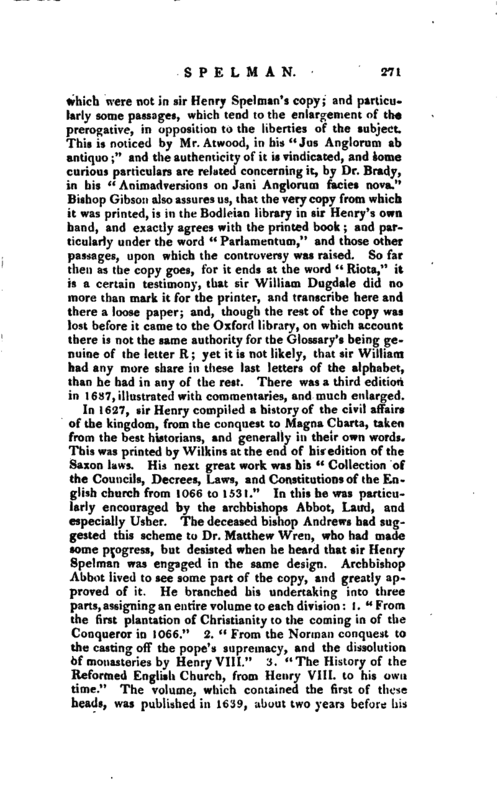 “A Discourse on the ancient Government of England in general,” “Of Parliaments in particular” and “A Catalogue of the places and dwellings of the archbishops and bishops of this realm, now or of former times, in which their several owners have ordinary jurisdiction, as of a parcel of their diocese, though they be situate within the precinct of another bishop’s diocese.” This appears to have been drawn up in the reign of James I. for the use of the archbishop of Canterbury. Some of these, and his other miscellaneous tracts, were published by Mr. Gibson, afterwards bishop of London, first as “The English Works of sir Henry Spelman,” to which, in 1698, he added “The Posthumous Works,” and both collections were reprinted in one vol. fol. in 1723. Some correspondence between Spelman and Wheelocke is among the Harleian Mss. No. 7041.